Taken from the album Philip Oakey and Giorgio Moroder (released on July 19th 1985), the title track to the movie Electric Dreams reached #3 in September 1984. Moroder is an Italian music producer who is particularly remembered for his work with Donna Summer on the hits "I Feel Love" and "Love to Love You Baby". "Together in Electric Dreams" was the only Top 40 hit single for Philip Oakey and Giorgio Moroder as a collaboration. They released two further singles in 1985, although they weren't as successful. "Good-Bye Bad Times" reached #44, despite a huge budget being splashed on the video, and "Be My Lover Now" stalled at #74. This poor chart performance ensured a quick ending to duo's project, and it would be another 23 years before Moroder produced another album. The track was penned for a male solo vocal, and the director of the Electric Dreams movie, Steve Barron, suggested that Philip Oakey should be the vocalist - he had directed The Human League's "Don't You Want Me" video in 1981. 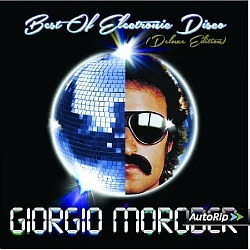 The track was recorded in just one take, but Oakey encouraged them to record a second take which was not used by Moroder for the final release. Although the single was recorded to promote the film, it became more successful and well-recognised than the movie itself - the film was moderately successful in the U.S., but most definitely a flop here in the UK. In the video we see footage from the film mixed with additional scenes featuring Philip Oakey. These were added to advertise the film with billboards and posters in the background, although in many countries where the film was a flop, viewers just associate these with the song rather than the film. Now, I'm pretty sure I remember the song being slated by some critics, although I think they must have been tone deaf - it's a great song in my opinion!